On the road this spring took us to the ultimate baseball destination – Cooperstown home of the baseball Hall of Fame. Happy to say our two products are now sold at FR Woods, Cooperstown’s oldest baseball store which is a couple of doors down from the baseball Hall of Fame. 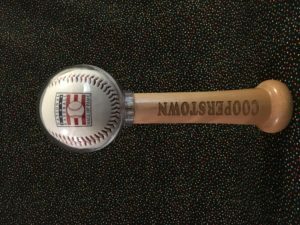 Both baseball gifts are engraved with Cooperstown on the bat handle. Check it out if you head out to Cooperstown this year for a baseball tournament, the Hall of Fame induction or just a trip to the baseball capital of America.